November 15, 2018 – In short: I love this book. I loved it from the very first moment. Because it comes across so effortlessly, showing how exciting money and numismatics can be. “Par ici la monnaie!” – liberally translated as “Here comes the Money!” – was written by a team of authors led by Anne Geiser and Maia Wentland. Its public are children and adolescents. And I am sure they’re going love the book, too! Perhaps for the easy-to-grasp texts, but most likely for the positively genius illustrations that are far from being smarmy and make no compromises as far as historical facts are concerned. Anne Geiser, Maia Wentland (ed. ), Par ici la monnaie! Une exposition du Musée monétaire cantonal. Musée monétaire cantonal 2017. 190 p., colored illustrations throughout. Paperback. 21 x 21 cm. ISBN: 978-2-940094-83-7. CHF 25. Let’s be frank: We have all read way too many introductions to numismatics that adults have devised for a younger public. Their content varies between slightly dry and pseudo-teenage language. The pedagogy therein reminds me of my own school days. Back then, it was assumed that children either take up interest in a topic by themselves, or they don’t. With “Par ici la monnaie!”, the child-oriented approach to numismatics has reached the modern age. From antiquity until the present, from pre-monetary means of payment to tetradrachms and talers to the Euro, from stock to economic systems to the modern national economy, the book does in fact cover all topics a future adult should know about. In doing so, it never gets lost in the nice little (and oh-so-redundant) details, it makes do without the usual numismatist jargon and, in a most entertaining way, it opens up a cosmos to the young readers that otherwise probably would have bored them to death. Should you buy it? Well, you all probably already know enough about numismatics. Which is why I have a better idea: This introduction should be translated (at least) into German and English – and then be distributed to as many children and schools as possible. For this is what literature looks like with which we can interest our offspring for the most exciting and indispensable thing in the world, for money, for coins and bills – and last but not least: for numismatics. 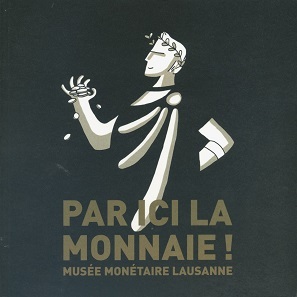 You can order the book for 25 Swiss francs from the Musée monétaire cantonal. We recently presented another book initiated by the Lausanne Money Museum on Celtic numismatics, which also convinced us with its concept.